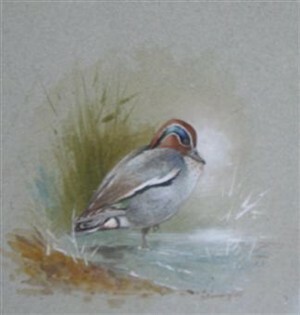 Portraits from a much-loved wildlife artist | The Dacorum Heritage Trust Ltd.
Gordon was one of the best known and well-loved artists of the South West Hertfordshire area for over 40 years. He lived with his wife at Redbourn and then Water End (from 1980) and portrayed many scenes of the natural world surrounding them. Gordon left school at 15 and became apprenticed to an ecclesiastical artist in St Albans. Although he was dyslexic, (or perhaps because of it), he had a fine artistic sense which was encouraged at school and expanded during his years at Faithcraft. He attended part-time classes at St Albans College of Art and soon began to express himself in a wide variety of mediums. Painting with water colours and oils, engraving, sculpting, laying gold leaf, decorating stained glass, carving wood and other crafts necessary for church restoration work, were all part of his daily life. He married Betty Boyce in 1958 and by the mid-1960s he decided to become self-employed. His first exhibition in 1967, in London, of wildlife paintings was a great success. 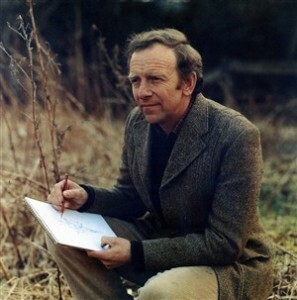 He even appeared on television programmes such as ‘In the Country’, where his growing knowledge of the countryside, especially Hertfordshire and his beloved Dorset, was shared with a wider audience. He wanted farming and the countryside brought into national conservation policies. His first published book of paintings, ‘Beningfield’s Butterflies’, appeared in 1978. Gordon had acquired a love of butterflies from an early age and was also an excellent field entomologist. The original pictures from the book were sold out on the exhibition’s preview day! Subsequently, he became President of the British Butterfly Conservation Society in 1990. 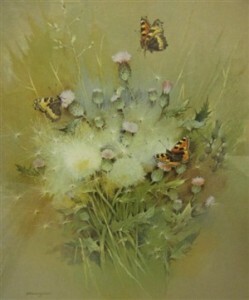 In the Spring of 1981, the Post Office commissioned a set of four butterfly stamps from his beautiful paintings. He later followed this with a set of insect stamps. Gordon was always willing to do a good turn and involve young people in the wonders of the natural world, so he kindly came to the school where I was teaching in St Albans to talk to my class of infants. He even gave us a signed copy of his World Wildlife Fund poster, full of endangered animals from many different countries. A tall, fair-haired country gentleman, with a gentle, approachable manner, he was a good all-rounder, counting fly fishing, shooting and field sports among his interests. His fishing companion was sometimes Eric Morecambe and one can only imagine the jokes they shared. His last book, ‘Beningfield’s Vanishing Songbirds’, was unfinished at his death, but his close friend Robin Page, Chairman of the Countryside Restoration Trust, completed it with Betty’s invaluable help and published it in October 2001. Dacorum Heritage Trust is making a serious attempt to collect his books and paintings, as a tribute to this gifted and sorely missed local artist. 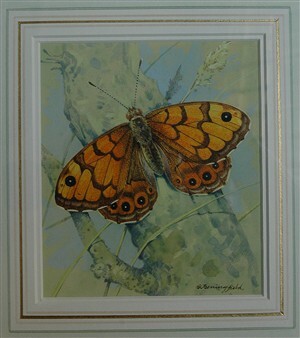 An original Beningfield watercolour of a Wall Brown butterfly was purchased by DHT in 2008. Any further donations of Beningfield ‘memorabilia’ would be warmly welcomed, since he is still an important figure in our local heritage story.